Birthday / How old is Hennessy Carolina Age December 22, 1995. Her age as of 2019 is around 24 years. Hennessy Carolina is a model, reality TV star & a social media celebrity, who is better known for being the younger sister of hip-hop entertainer Cardi B.
Hennessy was born on December 22nd 1995 in New York City. Both of her parents were born in the Caribbean, and had met after moving to the USA. She was raised in The Bronx alongside her big sister Belcalis, who is better known as the rapper Cardi B. Cardi is 3 years older than Hennessy & was born in 1992. 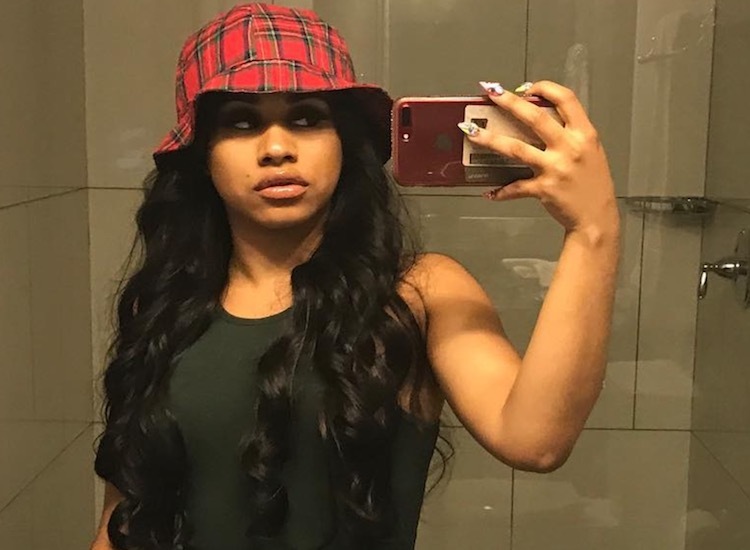 Repeatedly questioned over her real name, she has confirmed that Hennessy Carolina is in fact her real name. She states that her father was at an early Christmas party at the time of her birth, so came to the hospital a little tipsy, and decided to name her after his favorite brand of liquor while her mother was sleeping. He added the Carolina into it to make it sound more feminine. In March of 2015, Carolina began building her own social media career through her Instagram account @HennessyCarolina. As of 2019, she has over 4 Million followers to her account & has been labelled by the LA Times as The social media influencer to watch. Unlike most social media accounts that rely on photos & selfies, the majority of her posts are videos. She has been praised for this as it depicts her life from all angles and she comes across as a ‘real person’. Many of the clothes Carolina wears on her social media is from the brand Fashiona Nova. She reportedly earns a few thousand dollars a month just for wearing their outfits & dresses. The same brand has also previously worked with her sister. She also appears on Twitter under the same handle, but that account is yet to reach the same level of fame that her Instagram account has seen, with only 15,000+ followers for it. As of 2019, she is managed by The KSR Group, who are an entertainment booking firm specializing in artist and production management, and social media marketing. In 2015, her sister Cardi B was cast in the TV show Love & Hip Hop: New York. The show was used to highlight her transition from an exotic dancer to a famous rapper. Carolina was also cast in the show, first just a guest star in Season 6 for 2015 and 2016. For season 7, she was upgraded to a supporting cast member. Hennessy was predominantly featured as the levelheaded one who was able to calm her sister down, as Cardi B was seen involved in numerous altercations throughout the show. Carolina earned herself many fans as she was not afraid to tell her sister when she was acting wrong. She has said that she was glad to be a part of this show, as she had previously received a lot of negative attention for ‘copying’ her sister and this show was able to highlight that the two are actually just extremely similar. Wedding / Husband / Dating / Marriage / Boyfriend Currently Not Married.